Print fully formatted HTML/Web pages from within Pocket Internet Explorer (PIE). Prints in Color!! NOTE: This download is the full PIEprint shipping version. If you haven't purchased a registration code yet, no problem! This will install as a fully-functioning free 30-day evaluation. Pocket PC WM6.1 and earlier (see links above). Registration Code that permanently unlocks the evaluation mode. $24.95 - Buy PIEprint Now! Click here for volume pricing. 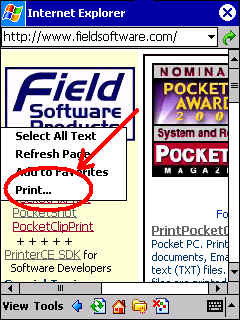 PIEprint allows printing fully formatted HTML files from within Pocket Internet Explorer (PIE) on Pocket PC (WM6.1 and earlier) devices. PIEprint offers a variety of printing options and prints to a wide variety printers using Infrared, Bluetooth, 802.11b wireless network and serial connections. Download PIEprint installer by clicking the "Download" link above. 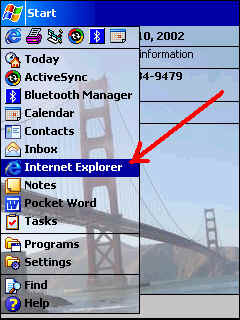 On your Pocket PC, start Pocket Internet Explorer (PIE), usually found in the Start Menu (below left). In PIE, go to the HTML page you want to print (below right). You will see menu pop up that includes "Print" option (below right). If the Print option is not on the menu, try another empty part of the HTML page. Not on an image or link. Tap on Print. If you are trying PIEprint's free 30-day evaluation, you will see the "Evaluation" screen (below left). Simply tap on the "Use PIEprint Evaluation" button to proceed. After you purchase PIEprint, you will receive a registration code that you enter at this screen and tap "Register" to unlock PIEprint for your use. Now you should see the main PIEprint screen (below right). Print Sizing: Some HTML pages are too wide to fit on the printed page. You can select "Shrink to fit to Page Width" to print a "too-wide" HTML page. You can select a custom resize percentage to force printing a page smaller or larger than designed. Print Range: Allows you to select a page range rather than print all pages of an HTML file. Number of Copies: Set if you want to print multilple copies of the print job. Print Header/Footer: Prints header containing HTML page title and page number, plus footer containing URL address and date/time of print job. Reduce Text Size: Some HTML pages print with the text larger than desired. Selecting this option reduces all text sizes by about 1/4. Continue Button: Tap this after setting all PIEprint options to continue to "Select Printer" screen (below left). Quick Print Button: If you have previously selected printer and other options (see "Select Printer" below), you can tap Quick Print to use current printer and paper selections to begin printing right away. Cancel Button: Returns to PIE without printing. About Button: Shows About screen with current PIEprint version number. After selecting any option changes, tap "Continue" button to go to the "Select Printer" screen (below left). See "Printer Options" for more info. Select your printer (below right) and any other options. Tap Start Printing button and PIEprint will begin processing the HTML page (below right) and begin printing. 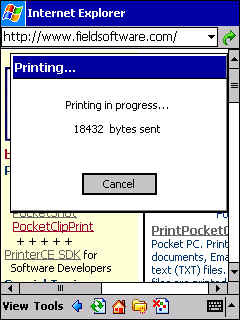 Once printing is complete, PIEprint will return to Pocket Internet Explorer. 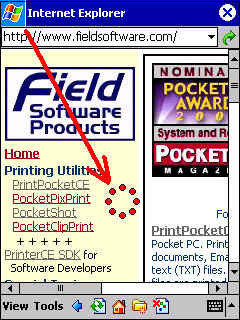 PIEprint supports all Pocket PC WM6.1 and earlier devices. Note: WM6.1.4 and WM6.5 use different version of IE (Internet Explorer) which does not support addition of "Print" option to context menu - so PIEprint will not work. PIEprint does NOT support the following tag categories: Script tags (ie. Java Script), CSS (Cascading Style Sheet), link, inclusion, style and form tags. PIEprint does not work with AvantGo - you will not be able to print WEB pages downloaded by AvantGo. Volume discounts not for resale - For quotes on larger volumes, info on using purchase orders, or other questions email sales@fieldsoftware.com. All volume pricing is on a "per purchase" basis.